The colors are changing and the temperature is dropping – fall is just here! The beautiful scenery is great inspiration if you are planning a wedding in the next couple of months. Incorporating small, subtle fall elements in your decor and theme will help you create a current and seasonal feel throughout your big day. Follow our suggestions for the perfect autumn wedding! Whether it’s a barn or burlap, fall is the perfect time for a rustic wedding. It doesn’t get more rustic than a barn venue, but if that is not an option, include smaller elements to create that same vibe. Anything wood, such as a tree slice cake stand or barn wood signage, is a good place to start. If the temperature hasn’t fallen too low, you can take your guests outside to enjoy this wonderful season. If your venue will allow it, set up a firepit with smores supplies for a camp-style feel. 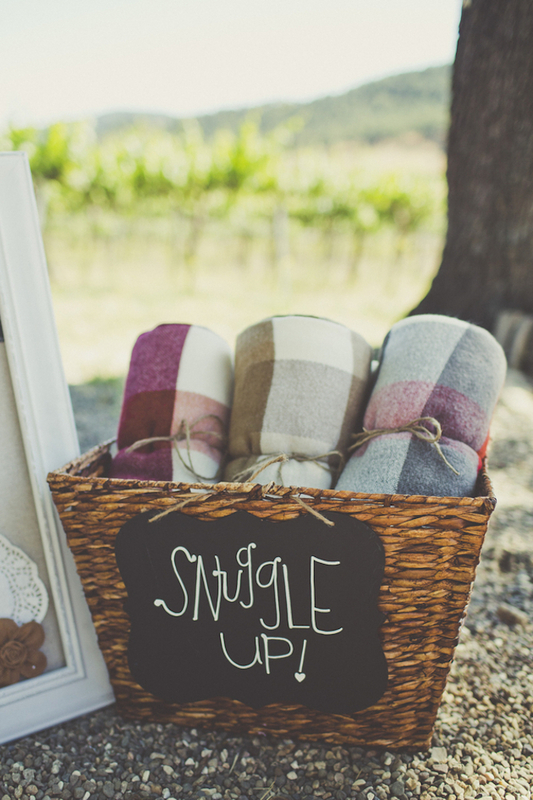 Add warm, assorted blankets to keep guests cozy and warm while they are outside. You could also serve hot chocolate and cider to keep the cold away. As long as your guests are comfortable, they will have a blast! Reds, oranges, yellows, and browns are traditional fall colors but don’t let that limit you! Fall is a time for deep shades – think burgundy, plum, navy, and scarlet. These darker colors will be a great complement to the changing season. With colder temperatures, it can be difficult to have a fully outdoor wedding (especially when it gets closer to winter). Bring elements of the outdoors to your indoor venue to make it feel like autumn. Using leaves or pinecones in your decor, such as center pieces, can make it seem like you are right outside. Your invitations are the first exposure guests will have to your wedding. Include rustic elements like wood or burlap to create a fall theme that starts as soon as your guests open their invites. Check out some of our categories from our portfolio to get started with some fall wedding inspiration for your wedding invitations. Just a reminder, all our designs can be 100% customized to fit your exact style and wants.